Upon returning home this past weekend, I choked back tears as I watched my little girls so excited to see one another. It feels great to be home, and having Zoe doing so well is icing on the cake. I was concerned we'd return home and she'd need close monitoring, but that's not the case. Zoe had her follow up appointment with her local cardiologist, Dr. Stock, today. He's been our lifeline in Phoenix for the past 4 years and it was great to see his face light up when he saw how wonderful Zoe looked. He fed her ego, calling her a Super Star; then let her rule the office for a good hour. Overall, Zoe sounds and looks wonderful. She had a full work up (minus chest x-ray which wasn't necessary). Her ekg, spotless. Sats 87-88 (normal with her fenestrated Fontan). BP normal. Echo, great. She has no tricuspid regurgitation, LPA looks wider than ever, aortic arch looks great, no fluid around heart or lungs, function is very good. Liver is a "2" (measurement of how taxed the liver is from new pressures) and will decrease as her body acclimates to her new circulation. All-in-all, we're doing great and Zoe's heart is still smiling. 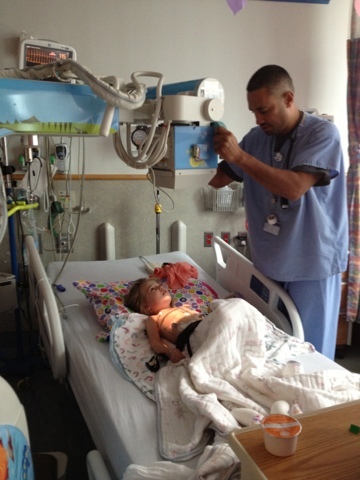 During her echo, Zoe asked if she could see her heart smile again. The echo tech was super confused :) When the tech showed me her Fontan, she said, "wow, who did her surgery?" I told her "Dr. Spray" and she smiled. Pretty impressive scary when the echo tech can tell the difference between surgeons. 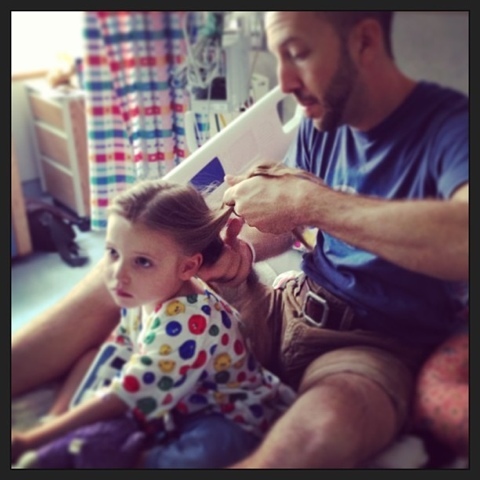 Zoe is due back for another cardiac visit in three weeks. We're beginning to wean her diuretics today and she'll be completely off of them in 2 weeks. Again, I'm so impressed with Zoe's ability to recover and heal. Dr. Stock is happy, we are happy, Zoe is happy. It's time to LIVE and GROW UP and BE HAPPY. 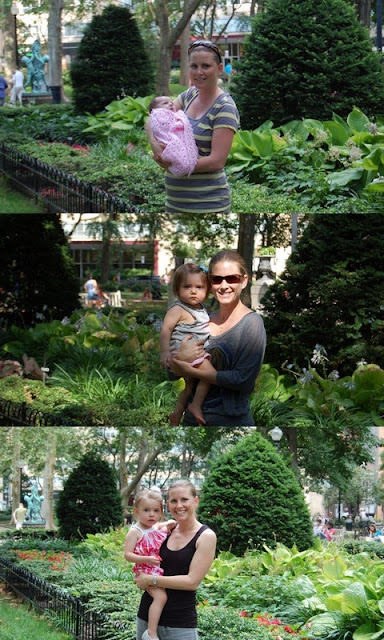 One of my favorite "must get photos" is Zoe and I in Rittenhouse Square (a fabulous little park in Center City). Every in-patient stay at CHOP, ends with the same photo. I look forward to this photograph every year. It's a marker of our journey and we'll be growing the collection as they years go by. 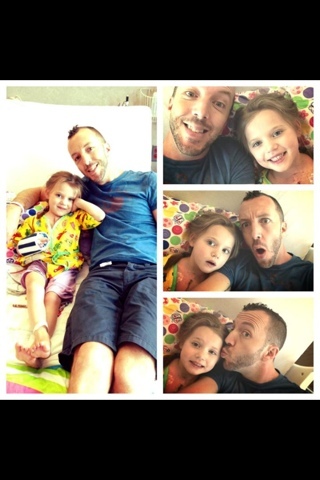 As many of you know, Zoe had her post-op visit with Dr. Szwast yesterday. This was our "stay or go home" appointment. Admittedly, I was nervous. 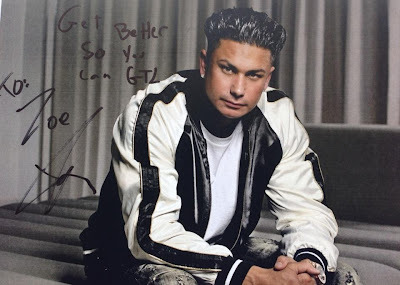 It turns out, Dr. Szwast had nothing but good news for us. Zoe's Echo and chest X-ray looked great. She has no valve regurgitation, function looks great and flawless repair with a "smaller fenestration." Her liver is doing well and didn't take a hit, which can sometimes happen with this new anatomy. 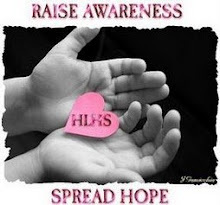 Plan is, a lifetime of follow up to keep an eye on her heart function and liver. Post-Fontan is wonderful, but as I've heard many times over, it's "a faulty circulation," meaning it isn't ideal and can cause significant complications. Given her speedy recovery and her body's quick acceptance to the Fontan, Dr. Szwast is very happy. 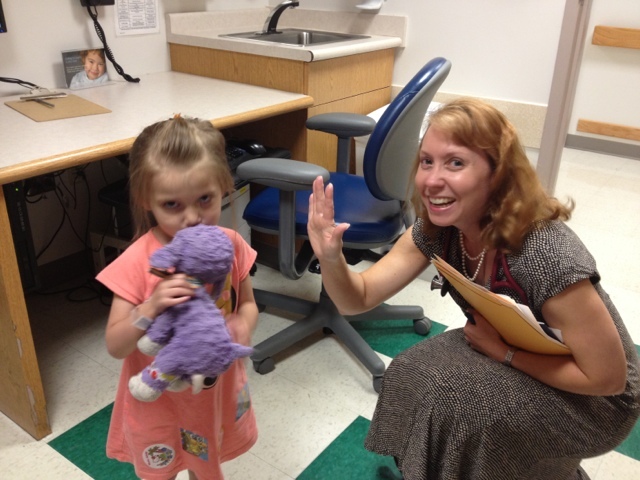 High fives from Dr. Szwast; Zoe was too fast! A great appointment means... we're free to leave!!! We're staying for suture removal on Friday and heading home Saturday. Zoe is so excited to go home. She's looked forward to returning home since the second day we arrived in Philly! We're so happy it's sooner than later! Prior to Zoe's Fontan, based on stories I'd heard, I figured it would take a week or so for Zoe to return to her normal self. Well, that simply isn't the case. 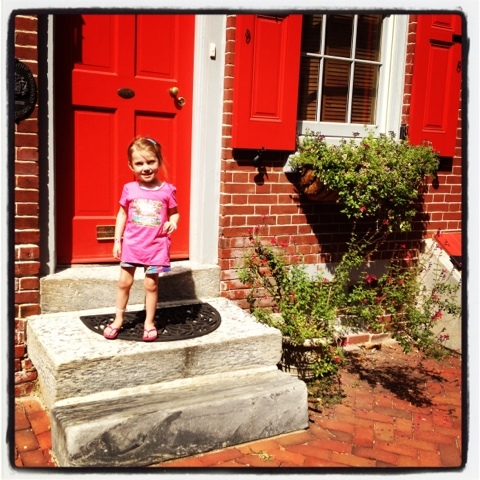 She woke this morning, happy as a clam - talking about how we need to bring Emmy next time we come to Philadelphia. She insisted on going for a walk today, so we did. Lots and lots of walking (with Zoe mainly in the stroller). Hard to believe she's not had any pain medication (including Tylenol) since Sunday evening! We decided to do some sightseeing and check out historical sites we've not been to, but always had on our list of "things to do... next time." 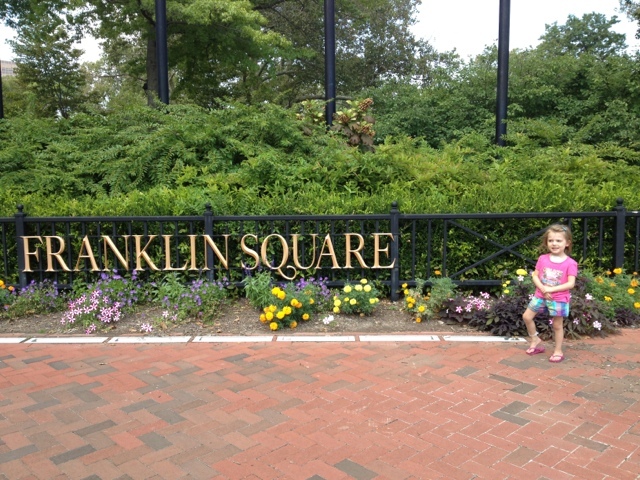 Zoe, the incredible trooper, insisted on riding the carousel in Franklin Square, shared my hot dog and fries and played mini-golf. Seriously, this girl was in the Operating Room a week ago today having her chest opened! Yes, this seal was sanitized! Not following the "no arms above head" rule. 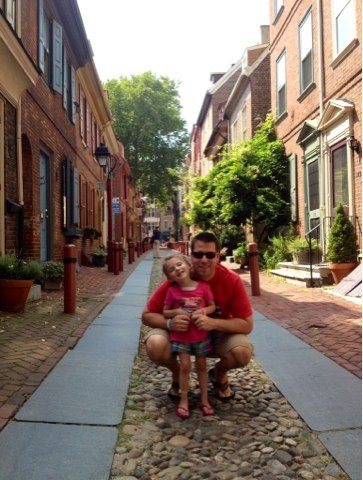 We also visited a place Caleb wanted to check out - City Tavern. It's the oldest pub in the United States, opening in 1773 and site of the first 4th of July celebration. 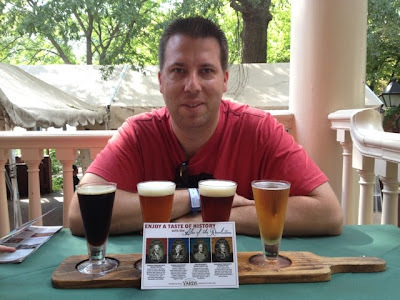 They serve beer made from recipes of George Washington, Ben Franklin, Thomas Jefferson, Alexander Hamilton. We decided to get a flight, since we wanted to try them all. Pretty darn good! 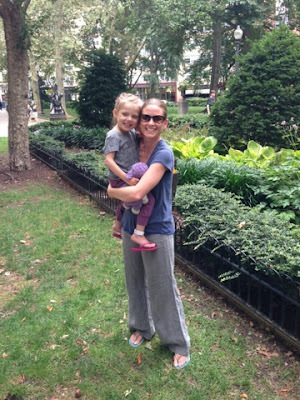 As we were walking around the city, Zoe said to me, "Mom, I'm glad I got my heart fixed." 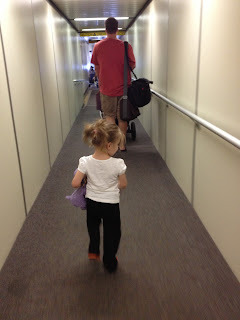 All this time, I worried she would be angry and sad that we forced this journey upon her. Today, she showed me that her soul runs deeper than I could've imagined. She feels good, and is happy. Zoe's favorite on Elfreth's Alley, "Obama's House"
Tomorrow is Zoe's post-op follow up appointment with her cardiologist at CHOP. We expect nothing but good news. It's a bit surreal still; we couldn't be more pleased. We're very much looking forward to heading home this weekend and seeing Emerson. We've done lots of Skyping this past week, but I really could use a BIG HUG from this sweet princess! We stayed the course, and all is well. Zoe woke to the echo tech, then the X-ray tech. The echo tech showed us Zoe's repair. Such an incredible sight to see!!! It's truly remarkable. 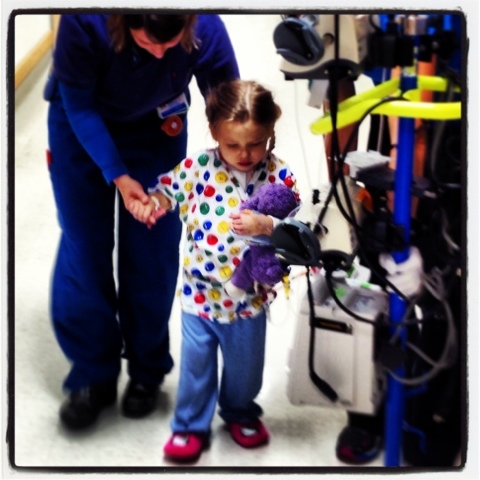 At morning rounds, the cardiac team continued to be blown away by Zoe's recovery. We had a few candid conversations with practitioners who indicated the recovery is far superior to what they've seen as of late. We are so stinking thrilled! 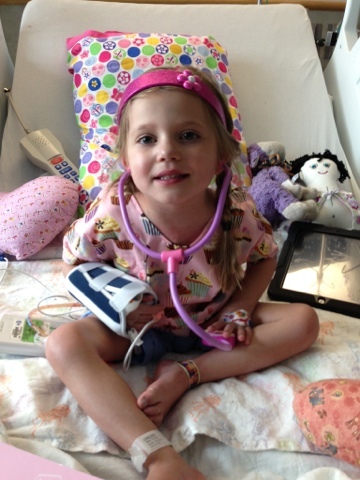 Zoe's cardiologist, Dr. Szwast, reviewed Zoe's pre-discharge echo this afternoon. The repair is perfect. Her heart IS happy! WE ARE FREE!!! It's official... Less than one week post-Fontan and we're outta here! 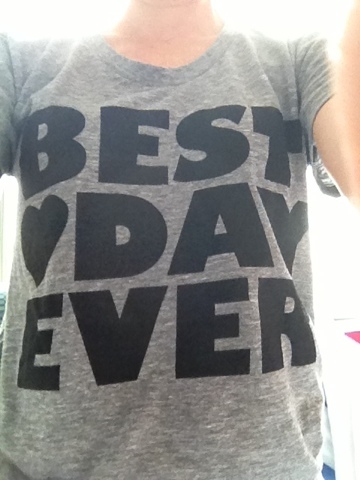 Today, my wardrobe couldn't be more appropriate! We plan on enjoying Philly for a few days while we wait for Zoe's follow up appointment before we get the "all clear" to fly home. Assuming no fluid accumulation around the lungs, we'll be back home this weekend! 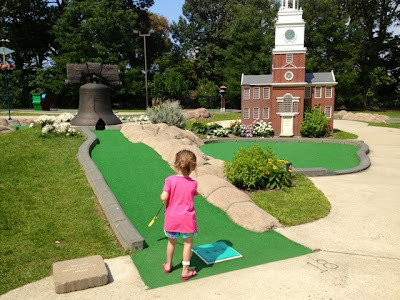 Aunt Stephie and Uncle Paul are coming Wednesday to help out with Zoe... but, instead of the original plan of being inpatient, we'll be able to visit, continue recovering and celebrate outside of CHOP! Zoe is super excited to be leaving shortly. She picked out her discharge outfit. She thinks it's her perfect wardrobe for today - camo shorts and a Phillies tee! We like today's plan. We're hoping no one goes off script! This morning Zoe will have her discharge echo and X-ray to confirm all is well. Next, some follow up planning to determine when we can head back to Phoenix. We'd planned on sticking around a full week post discharge, but Zoe's recovery has been so tremendous, we may be able to squeeze in a follow up visit later this week and head home this weekend! Please send good vibes today that all goes as planned! The pharmacy has our Rx's and is awaiting a thumbs up post-echo. While you're thinking of Zoe today, please also send some good thoughts and prayers to her fellow HLHS buddy, Bodie, who is needing to head back to the OR this morning following his Fontan last week. He needs his pacemaker adjusted and sadly must have his chest reopened. 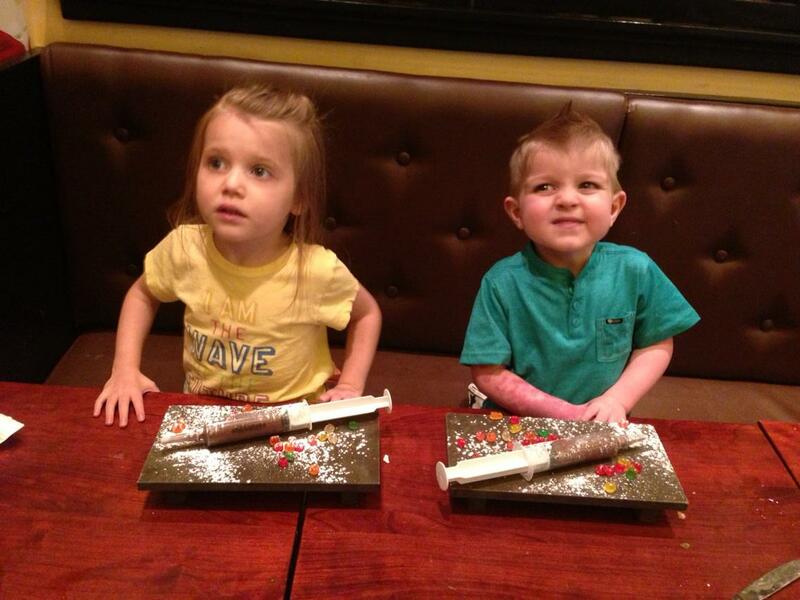 His mom, Amy, is one of my dearest friends and could use the uplifting spirit of Team Zoe. We'll keep you posted. For now, Zoe is passed out while the sun rises over downtown Philly. This morning's chest x-ray looked great and Zoe's chest tube was removed about 10 minutes ago! We now have no tethers, except her ECG leads. Can you feel it? We just took a huge leap towards discharge. Another chest x-ray in a few minutes to confirm all looks good post chest tube removal, then morning rounds to find out "the plan." We still need labs, an echo and to get all of our medications squared away. I'm not going to speculate on a discharge day as all heart moms know that's bad juju, but it's soon... LESS THAN ONE WEEK POST-FONTAN! Rounds in the step sown unit didn't happen until late (around midnight), so we didn't take part. Morning rounds with the attending will be much more informative. Zoe is recovering brilliantly. She continues to do well. Frankly, she's ready to leave, but for the chest tube, which hardly drained anything at all today. We are hopeful they'll remove the chest tube tomorrow. An early morning chest x-ray will confirm for sure if it's ready to come out. So, we'll certainly have more information after morning rounds. On a totally random note, a couple of years ago, The Ryan Seacrest Foundation built a recording/broadcast studio, located in the lobby of CHOP, called The Voice. 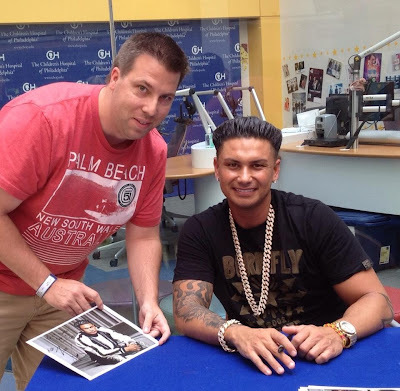 CHOP consistently has celebrities visit the studio to entertain and raise the morale of the many patients at the hospital. 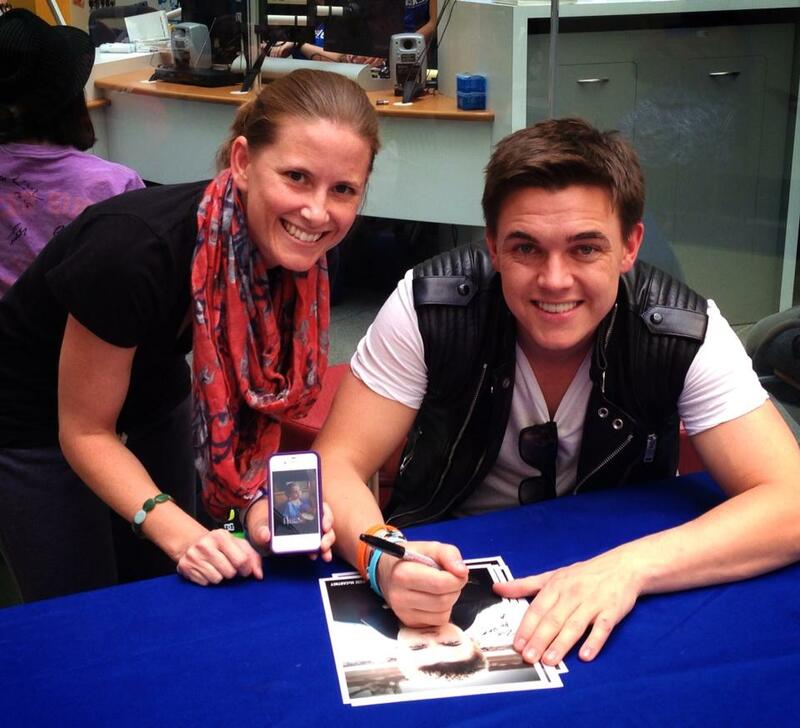 On Friday, we had the opportunity to meet actor/musician Jesse McCartney and DJ Pauly D from The Jersey Shore. While Zoe has no idea who they are, we thought it would be cool to get autohraphed pictures for her. Hopefully, we will have good news to report after morning rounds, i.e. that the chest tube will come out. We'll update after rounds. What can I say, other than... this blog post is dedicated to my BFF, Brian Golub, who put his life on hold for a week to be here with Zoe, Caleb and myself during Zoe's Fontan and recovery. He's been nothing short of a miracle-worker these past few days - giving reiki, holding Zoe in yoga poses to help her bowels, making her laugh and holding beauty parlor hours. I know that his presence made a huge difference in Zoe's recovery. Just days before Zoe's Fontan, Brian received his Reiki Master attunement and is full of healing energy. I sure wish everyone going thru something similar had an "Uncle Brian." They're definitely kindred spirits and feed off each other's positive energy. 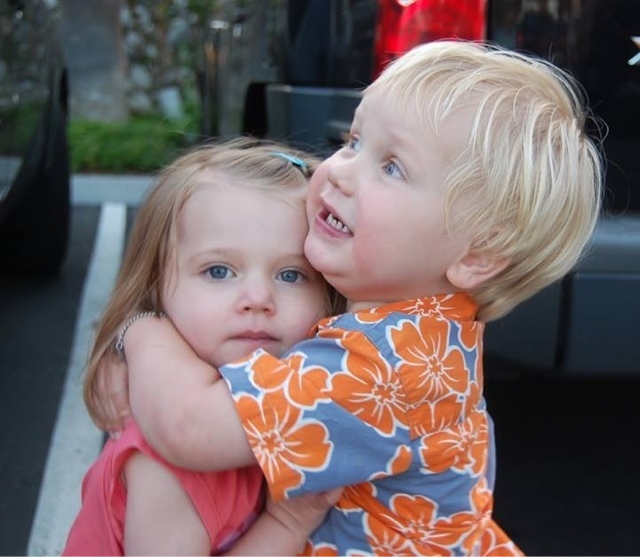 I could tell, this afternoon, when Brian left us to head to the airport, both of their spirits were a bit deflated. 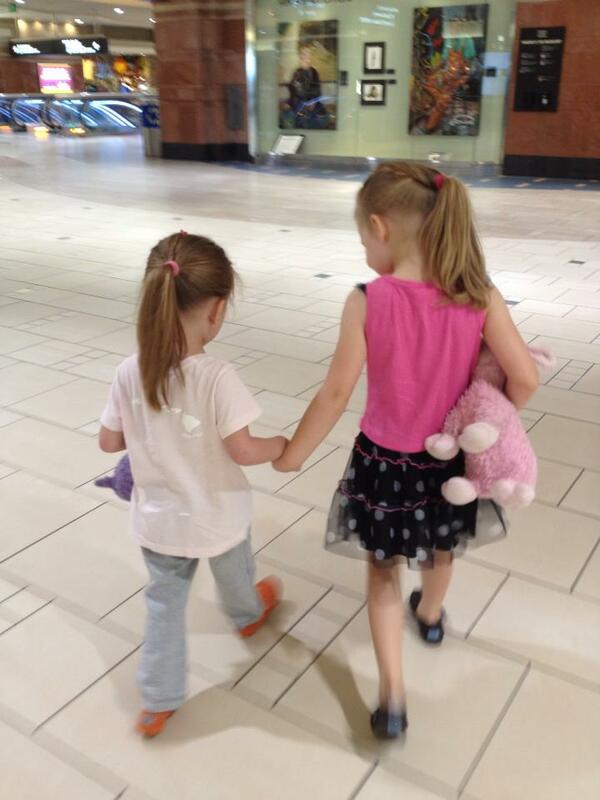 Here they are, two peas in a pod, bidding a gracious farewell. 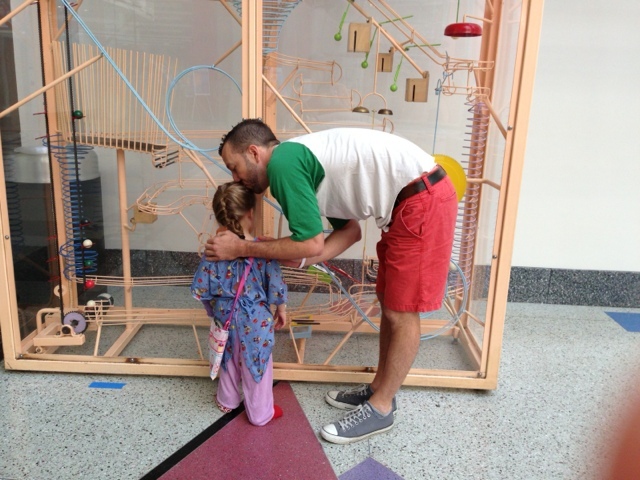 Thank you so much, Brian, for your undying commitment to Zoe. Our deepest gratitude. Another HUGE thank you, to my parents, who've been taking such good care of Emerson while we've been in Philadelphia. 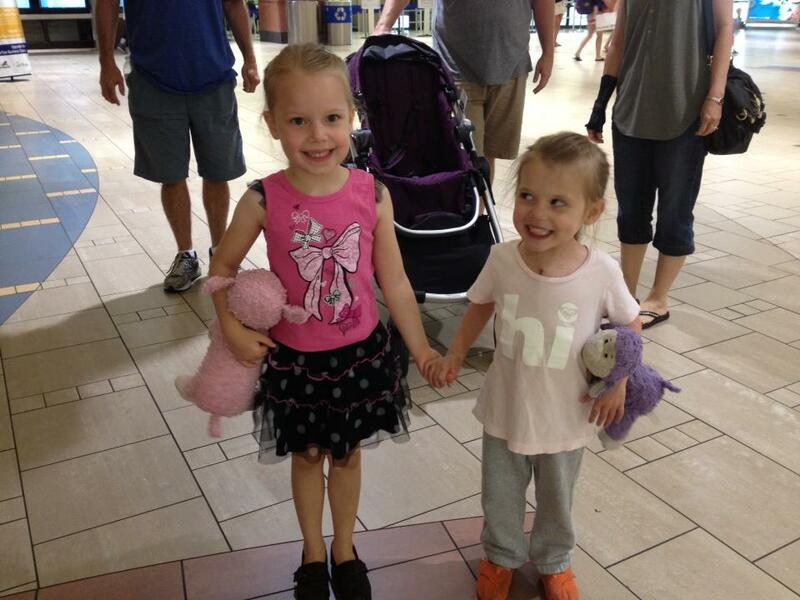 Emmy started school (twice over)... long story... and my mom and dad have been troopers. 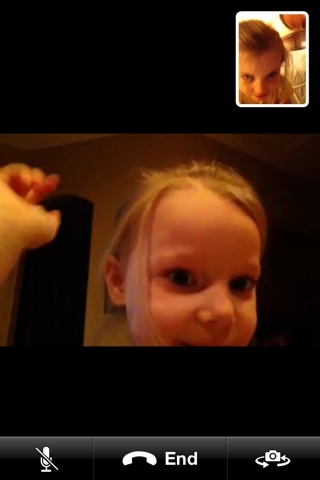 We're missing Emmy really bad and thinking we'll be seeing her sooner than later! Zoe's doing fabulous. She walked all the way to the atrium, up two flights of stairs and back to her room. If you know CHOP's layout, that's a huge feat! Dr. Spray's physician's assistant stopped by today and mentioned that they've "never seen a post-Fontan patient walk the day after surgery," on their own accord. The entire cardiac team is amazed at her speedy recovery, will and determination. 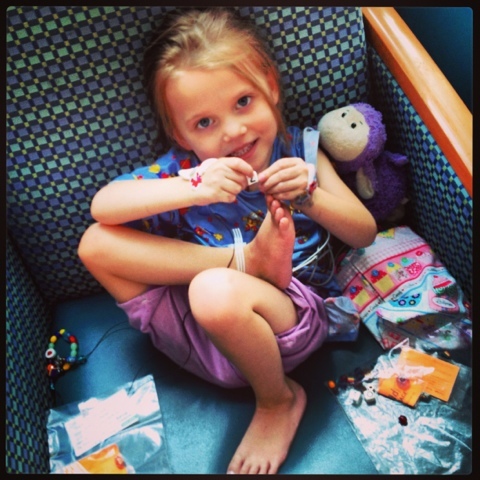 When we returned to Zoe's room, she decided to chill out and start stringing her Beads of Courage. She's simply incredible. Caleb and I couldn't be more proud of her and we know she has a full life ahead of her; she's going to do incredible things! It appears that we're on the road to discharge soon. 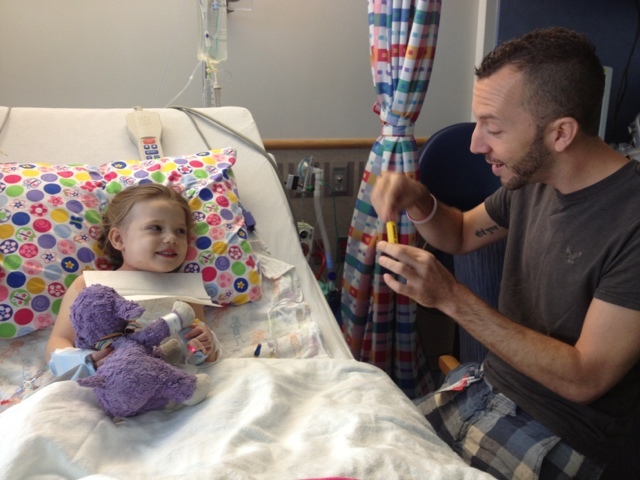 Zoe's IVs have been removed and we're counting the last of the drainage from her chest tube. I'm feeling removal is coming soon (perhaps tomorrow). She's transitioned to all oral medications and we received a list of her discharge medications today - routine for CHOP a few days before discharge. Many thanks, to all of you, for the continued love and support. We really feel blessed to have you on this journey with us. We felt surrounded by all of you during this hospitalization, making us stronger and wiser. 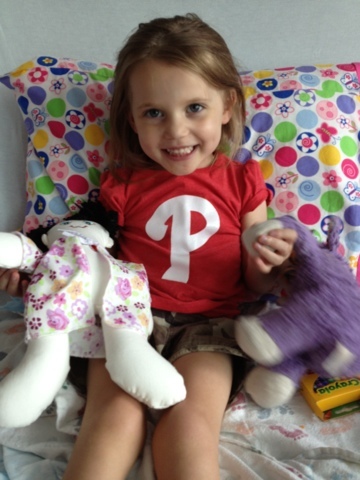 Yesterday, Zoe continued to make progress in her recovery. Due to a lack of "ins" and being "negative," meaning she was giving more output (urine/drainage) than taking fluids, she won herself IV fluids again. Hoping more drinking today and we can turn it off. Zoe did a good amount of walking yesterday. She certainly doesn't want to hang out in her room much... I don't blame her! We'll likely spend a good part of the day in the playroom today and we plan to head to step down with a room opening up soon. The best news yesterday... Zoe finally pooped! She's been really uncomfortable and complaining her belly hurt. 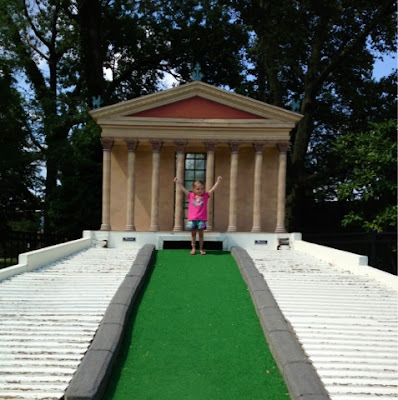 With help from some yoga poses, reiki and glycerin, she got her bowels moving! So, we're expecting a good day today. Full steam ahead for Miss Zoe! Goals are: more eating and drinking and less drainage from her chest. Overall, the team is really happy with her progress and have no real concerns. Thank you all for your continued good thoughts and prayers. Besides a lack of sleep, we're all doing quite well! Yesterday was a busy day! We started early with a chest X-ray which was a tad hazy, showing some fluid in Zoe's left lung. Nothing too concerning for her medical team. Once Zoe woke at 6:30 am, the days mantra appeared to be "progress," starting with removal of her Foley cath. Her vitals and rhythm were spot on, allowing for more progress - removal of her RA line and Fontan line. Around midday, the physical therapist came by to get Zoe out of bed. Instead of propping her up in a chair as planned, Zoe insisted on taking a walk! 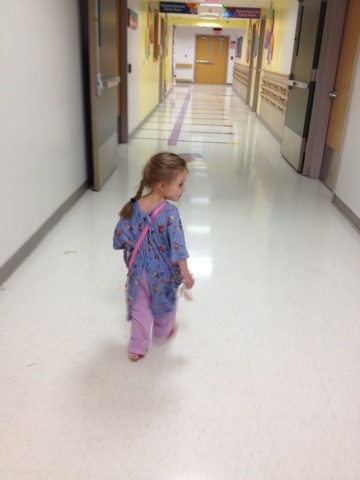 The girl is less than 24 hours post open heart surgery and out in the halls walking! The day's mantra continued with removal of the IV in her foot and Art Line. She began feeling more freedom and we could tell she was much more jovial (yep, jovial)! Definitely felt one of my top bucket list items was fulfilled after getting this picture of Zoe and her hero/surgeon, Dr. Spray, via text. At this point, we're pretty much ready to leave the cardiac intensive care unit and move to step-down but bed space is tight so we'll remain in this room, hopefully discharge soon straight from the CICU. The goal from here is continued progress - getting Zoe's bowels active and slow the drainage from her chest cavity. All-in-all, she is fast-tracking this recovery! Uncle Brian and I did another reiki session late last night for continued healing. Zoe sure takes the energy well... This morning's chest X-ray was improved. Sadly, her last IV went bad and the stick team came to replace it at 6:00 am (mommy tried to battle, but lost the fight). I was hoping we could bypass re-insertion but the team wants another placed as her chest drainage is a bit more than we'd like. Since ceasing the drainage is our ticket outta here, I figured it wasn't a good fight from my end. Today's plan, more walking, less drainage and more rest for Zoe. She's not been sleeping well and wants to just play, play, play! We've already made some progress today. Zoe had her foley cath pulled early this morning and both RA and Fotan lines are out. Her chest X-ray was a little hazy but should clear with added lasix and getting her into the wagon today for a ride around the CICU. She looks great; some pain today but Morphine helped take the edge off. Got her some breakfast and pediasure but the morphine is taking over and she's too tired to eat at the moment. Had morning rounds and they will also pull the Art line today. Likely moving to step down tomorrow!!! Zoe and I got some sleep last night. Thank goodness for the quiet, private room. Continued thoughts and prayers for steady progress appreciated! 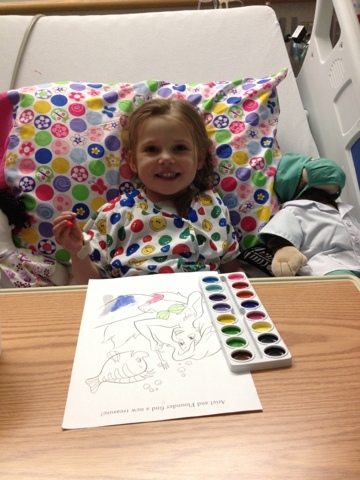 Zoe is settled in to her room in the Cardiac Intensive Care Unit. As you can see, she is still resting, but looking good. All of her numbers look very good, her post-op chest X-ray is perfect, and they are very pleased with how she is doing. Her body and toes are very pink, which is a change from the purple lips, toes, and fingers that we've become accustomed to. Her oxygen saturations are currently 94, which is a clear increase from the 88, give or take, which had become her recent baseline. While simultaneously performing Reiki on Zoe and speaking with the nurse supervisor, she stopped mid-sentence, and said, "are you doing Reiki?" When we told her yes, her eyes lit up and she said, "good, that will really help, keep it going." It was a pleasant surprise to receive that reaction and we will definitely keep the Reiki going and hope for a boost in recovery. With recovery from this surgery, however, things can change quickly. 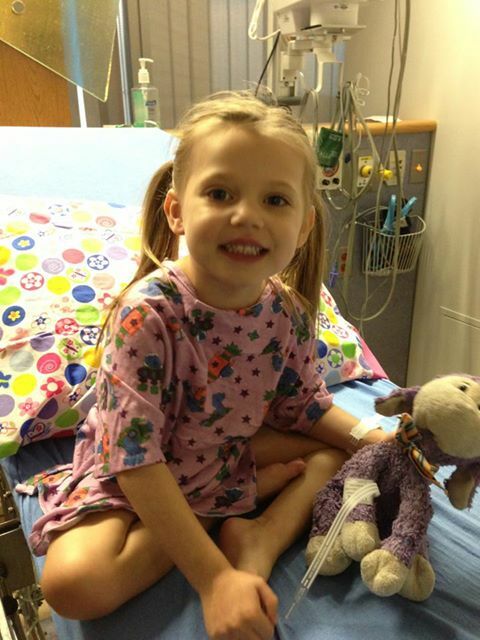 The major factor in her recovery will be the drainage from her chest tube, which runs through both lungs. If she continues to do well, they will try to get her to eat solid foods tomorrow and potentially start walking. Thanks again for all the positive thoughts, energy, and prayers. We will continue to keep you updated on Zoe's progress. Just met with Dr. Spray. All went well and her heart looked good. She is extubated and getting situated in her room. We will see her in about 30 minutes. Overnight is most critical. Keep up the good work, Team Zoe! It's time to recover! Just got word that the repair is all done! She is off bypass and they are closing her up now. We are waiting to talk to Dr. Spray. We should meet with him in about 15-20 minutes. We'll update again after we talk to Dr. Spray. Just got our first update...surgery started one hour ago and Dr. Spray is already through the scar tissue and on bypass. Yes, this is very fast. Typically we get updates every hour, but Zoe's nurse said she didn't even think the whole procedure would even take another hour. We met with Dr. Spray a few minutes ago. Zoe is in the OR. Next update in one hour. Surgery expected to last 2 hours. Send all good thoughts and prayers to our little warrior! We were told to expect our first cath update an hour into the procedure. At just shy of an hour, they came out to tell us they were done and didn't move forward with any interventions. Dr. Glatz explained that while the left pulmoary artery was slightly narrowed, it didn't cause any blood flow issues. He also explained that the pressures from her heart/pulmonary arteries were in the average range, and the percentage of her blood flow travelling through her collateral arteries was slightly lower than last time, thus no need to coil. Regardless of the lack of intervention, because they performed a cath, Zoe needs to lie flat for 6 hours. We're three and a half hours in, so just two and a half more to go. She's doing well, but a little puffy and groggy from the anesthesia. We had one minor incident with some bleeding from the groin site, but it's ceased. Right now, she's more concerned about which band aid she has on her neck cath site. 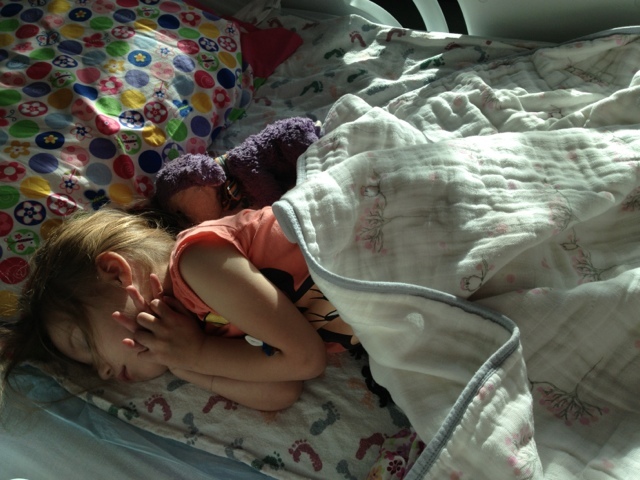 We'll stay inpatient overnight and Zoe will be prepped for surgery bright and early tomorrow morning. Please send good thoughts for Zoe to remain comfortable throughout the rest of today and for a successful surgery tomorrow. We just spoke with Dr. Glatz, Zoe's interventional cardiologist, who reviewed the preliminary results of this morning's MRI of Zoe's heart. He indicated that everything looked good on the MRI, but some slight narrowing of the left pulmonary artery remains; he also saw a decent amount of collaterals. Zoe's left pulmonary artery has a history of narrowing. 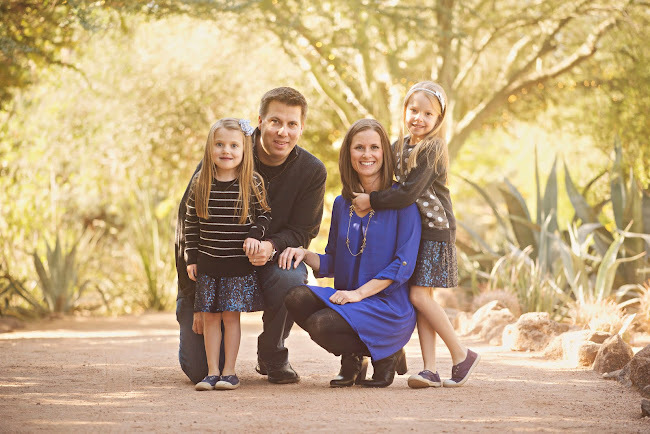 In September of 2010, Dr. Spray performed the hemi-Fontan, instead of the Glenn, since her left pulmonary artery was narrowed, and went ahead and patched the artery to the lung. Later, in July of 2011, Dr. Glatz observed further narrowing during a cath and ballooned it open to increase blood flow. On today's MRI, he didn't think it looked narrowed enough that it would require intervention, but suggested there was a possibility Dr. Spray may want to patch it again tomorrow, which ads a step to the Fontan. He'll consult with Dr. Spray during the cath, if necessary, once he's inside her pulmonary arteries/heart. Because of the amount of presence of collateral vessels, he indicated he planned to go ahead and coil/embolize. The theory is that by coiling, it lowers the pulmonary pressures, which can lessen the most common side effect of the Fontan, fluid retention in the chest. Because of the cath and intervention, Zoe will spend the night in the hospital tonight and have her Fontan first thing in the morning. She may experience lowered oxygen saturations tonight and low-grade fever due to the coiling. We'll get the next update in about an hour. It feels like we've been preparing for the Fontan forever. Since before Zoe was born we knew this day would come. 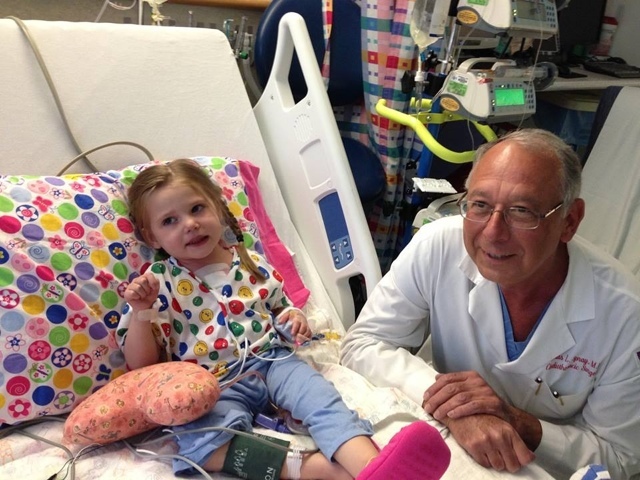 In the list of options presented to us to treat Zoe's Hypoplastic Left Heart Syndrome was a three staged series of open heart surgeries, culminating in the Fontan. 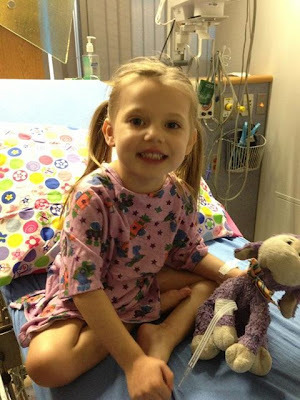 Most of you know Zoe's Fontan is scheduled for Tuesday, August 13, 2013. We arrived in Philadelphia on the evening of Thursday, August 8. 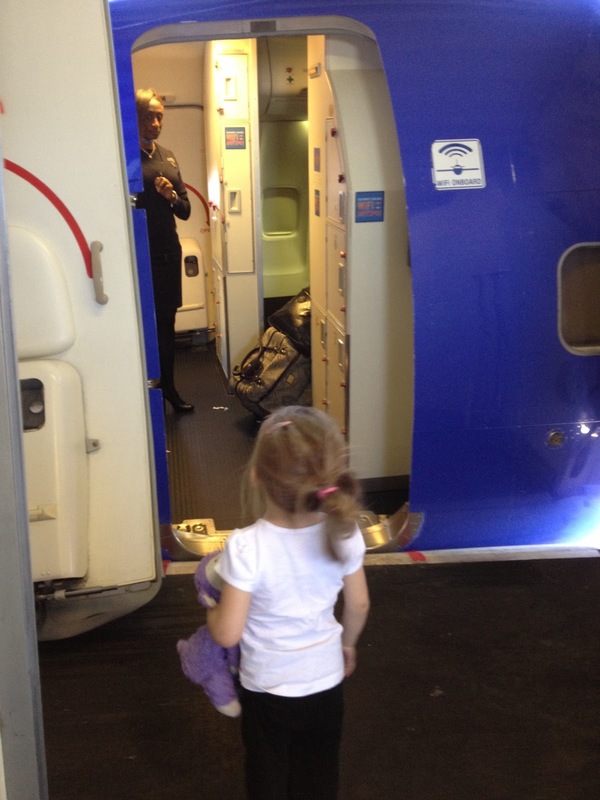 Zoe, while being scared to get her "heart fixed," was excited about the journey to Philly. On Friday morning, we had Zoe's pre-op appointment. 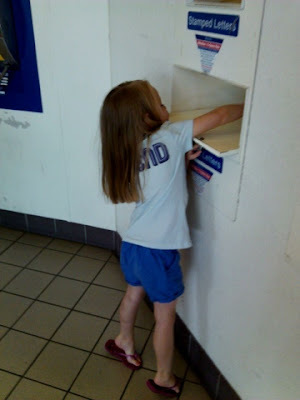 The appointment consisted of a check of vitals, EKG, echocardiogram, chest x-ray, blood work, and consultations with several researchers regarding ongoing research studies that Zoe qualifies for. Zoe did great on all of it, but was obviously not a fan of having her blood drawn. Fortunately, we saved that for last and they got all the blood needed on one stick. Afterwards we asked Zoe what she wanted for lunch, "mac & cheese and frenchies (french fries)." 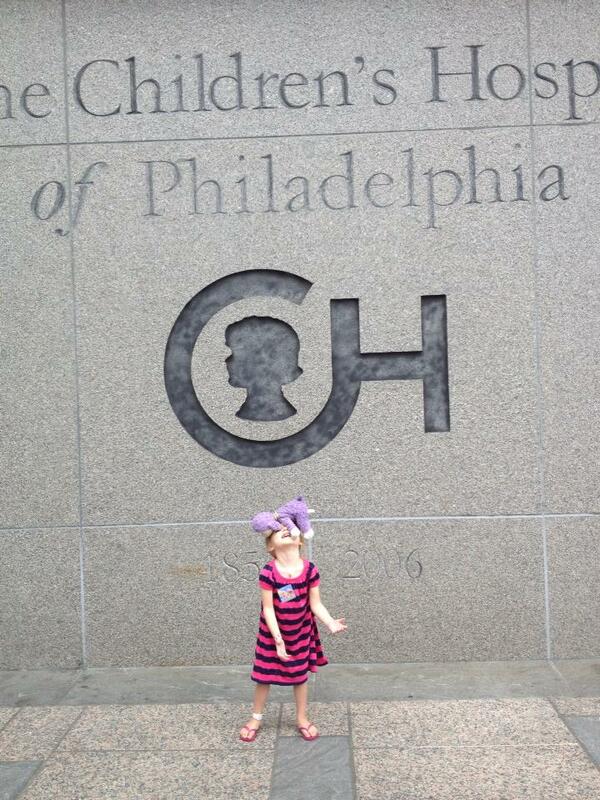 So we walked into Center City to get Zoe her requested lunch. While we were eating, a lightening and thunderstorm started. We took our time eating hoping the storm would move on. When the sun popped out, we decided to make a break for it and head back to our hotel. On the way back, the rain returned and we got a nice shower (we're Arizonans and don't know what umbrellas are). On the bright side, it was nice and cool for the remainder of our walk. On Saturday, we met up with Stacie and Tommy Jackley, who live near CHOP, and have a little man, Kellen, who has the same heart condition as Zoe. We ate lunch at Max Brenner's and topped off the lunch with a giant syringe of warm chocolate, served with powdered sugar, and gummy bears. Deep conversation over a bowl of waffle fries. 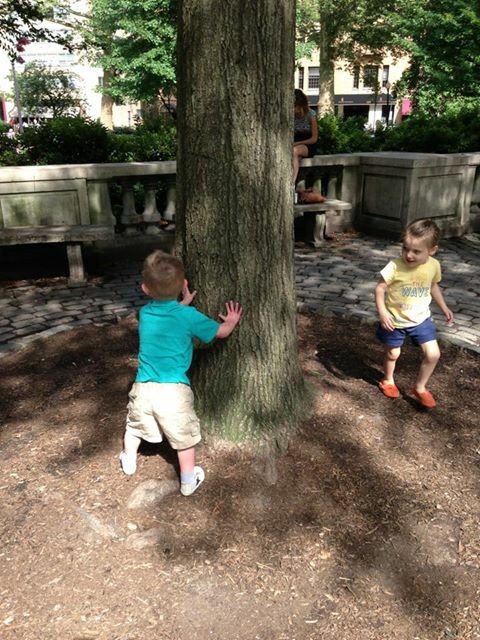 After lunch, the kids played in the Rittnehouse Square Park. It was a fun day that kept Zoe happy and mommy and daddy distracted from the upcoming surgery. Today we plan to have brunch at one of our favorite Philly restaurants, do lots of walking, and again try to stay somewhat distracted, to the extent possible, from the events of this upcoming week. Speaking of those events, we will report to CHOP at 5:30 a.m. on Monday morning. They will prepare Zoe for general anesthesia and once she's under, she'll have a cardiac MRI of her heart, which will provide clear pictures of the heart to assist Dr. Spray for the Fontan surgery. 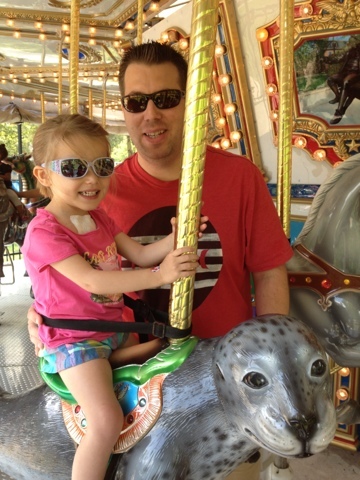 Dr. Glatz, Zoe's interventional cardiologist at CHOP, indicated that immediately after the MRI, while Zoe is still under anesthesia, he may perform a cardiac catherterization. He indicated that he will only do the cath, under a couple of scenarios: 1) If he feels like they need to measure the pressures in the heart (which the MRI can't do); 2) if there is some narrowing of Zoe's aortic arch, in which case he would go in and balloon (angioplasty) the arch, to allow for better flow; or 3) if they see a decent amount of collateral vessels that are affecting blood flow, he will go in and coil or embolize the extra vessels, which recent studies have shown, if done, can improve recovery from the Fontan surgery. Given the amount of collateral vessels present in Zoe in July of 2011, when she had her last catherterization procedure, it is likely that they will want to perform some coiling tomorrow. Off for one more day of fun, and hopefully a good night's sleep before we get serious on Monday. 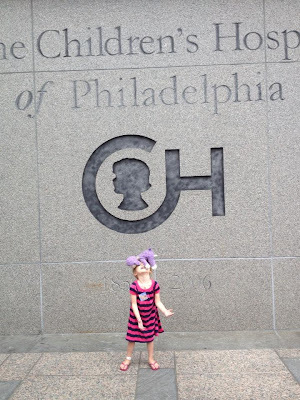 We'll be at CHOP bright and early and once the MRI is over and we find out if they want to cath Zoe, we'll update the blog. In the meantime, please keep sending Zoe positive energy and keep her in your thoughts and prayers.